Even in its early days, Althas has been a land shaken by conflicts. In the early days, these conflicts pitted the Anointed Kingdoms of Men against the dark and demonic forces that threatened them. However, with the passage of time the world has changed. With the Anointed order eroding away and new powers rising, another war looms on the horizon, a war brought on by Man's own actions. Thenodar, a burgeoning new kingdom in the North, and Anorthile, one of the last of the three remaining Anointed Kingdoms, now prepare for a war that will shake all of Althas. Old demons and new enemies gather in the shadows of both lands as each sets their sights on the ruined wilderness known as the Feralands. I was being sarcastic not to be negative but for humorous effect it wasn't an insult at all it looks resplendent I can only hope the rest of the game has as many influences from Tolkien's masterpiece. Originally, this was a hand drawn map. 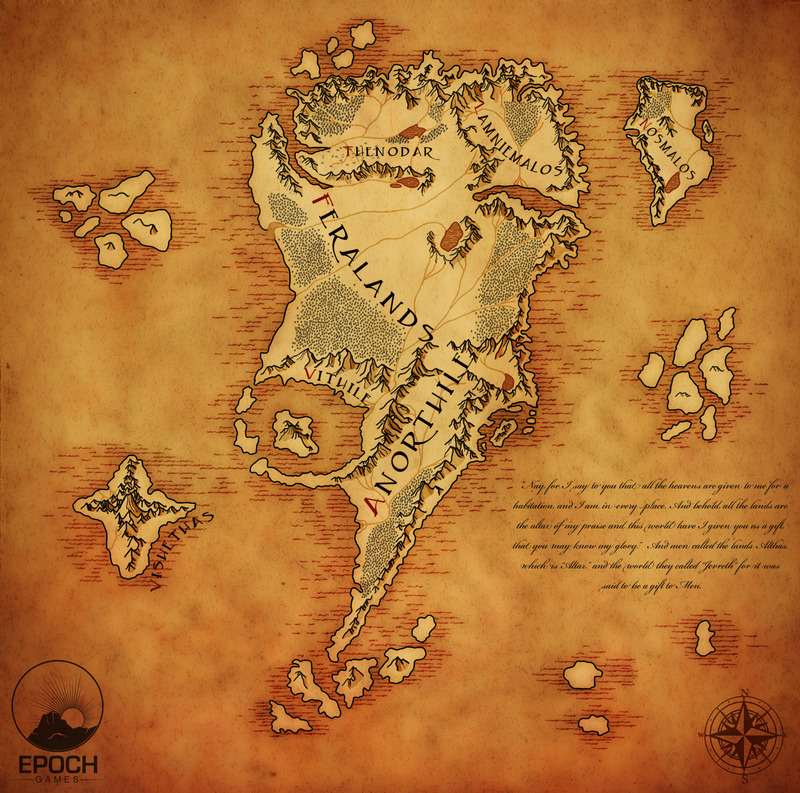 Cliroj, one of our concept artists, created this using the hand drawn map, our heightmap, and lore info. I am not sure what program he used, but I think it might have been just Photoshop. But in all honestly, the shape of a continent on a map is not what is so important, but what the continent looks like on the surface. At least from my perspective. How big is this map compared to (for comparison measures) Skyrim? Landmass, it is several times the size. Thenodar is about the size of Skyrim. WOW! That makes this map much more massive. There's quite a difference between saying, "It's about 32km^2" and "That small region you see up there called Thenodar is about the size of Skyrim"
Am I being too eager to ask for a release date? Hahaha..
Wow, wait. If Anorthile is kind of the size of skyrim... that woodland area in the western Faralands would be huge. Humongous. ****, so excited for some first eyecandy from the engine. Yes Vrossothos, the forest in the western Feralands, will be very large. About the size Mirkwood was going to be in MERP. So yeah, insanely massive. If Andorithile was only one of the 3 annoited kingdoms where were the others..? It seems like the 2 nations here already cover up the whole map. Also will the islands be used in game? If so I think it could make for some interesting stuff. Also will the feraland have any civilization in it? How will you be developing the world? As one whole map, or areas per level etc with persistence per level? There is that segmented world feature that's currently locked out in the SDK, reckon we'll see it in an update sometime, maybe something you are anticipating? That is the system we are anticipating ;) . It is in use in Star Citizen. We want the world seamless. Althas will be released episodically, with each episode or "chapter" being a self contained experience that opens up new regions. So as the game is released, the playable area will expand until the whole map is open to you. ARE THERE GOING TO BE WIZARDS IN THIS GAME??? Hmmmm. Depends on what you mean. Magic, yes, but not in an over abundance. If you look under "News," there are three First Look: Magic posts. They explain magic's history and such. Hey LoA team, my question is, will there be a possibility of non-land combat? Aerial, water, tree, use your imagination! Aerial would be rare if it was present at all. That would be a magic thing. We want naval combat; it is certainly possible in the engine. Whether that will appear in the first chapter or not we don't know. But naval combat and travel we do want in the game. Other types of things like fighting in the trees is not something we have discussed really.